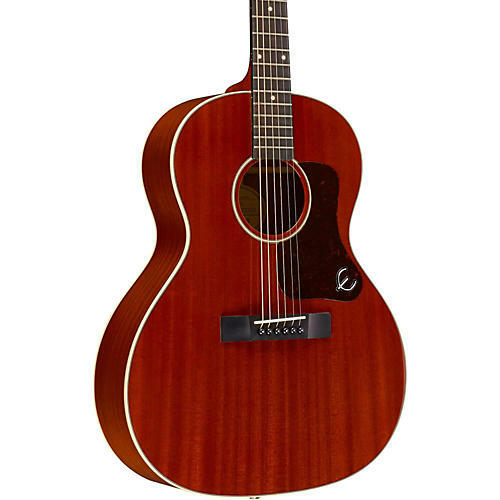 This Limited Edition Epiphone EL-00 PRO Mahogany Top Acoustic/Electric guitar is a direct descendent of Epiphone's original line of flattops which go back to the Golden Age of acoustic guitars, the 1930s. This smaller "parlor" or "blues box" style acoustic guitar is favored by blues players of all eras for its compressed, woody tonal quality, short scale and comfortable weight. The combination makes it ideal for fingerpicking or the bark of a bottle neck slide. It features a select mahogany body with solid mahogany top, rosewood bridge and mahagony neck, again, a mixture of tonewoods that'll fit right in the blues pocket. Now featuring the Fishman Sonitone soundhole preamp and Fishman Sonicore pickup, the EL-00 PRO Acoustic/Electric can be plugged-in and heard on any size stage with first-class acoustic/electric sound. The pickup is set underneath the saddle. The Sonitone sounhole preamp is an active preamp mounted in the soundhole with easy-to-access mounted rotary controls for Master Volume and Tone adjustment. Now you can make your adjustments during soundcheck and even fine adjustments on-the-fly during your set. No more running back and forth to your amp or the soundboard. The active preamp is powered by a single 9-volt battery. You can connect your Epiphone EL-00 PRO to a PA or amp of your choice with a standard 1/4 in. instrument cable. This Limited Edition EL-00 PRO Acoustic/Electric features a solid mahogany top with 3-ply black and white binding. This top will improve in tone as it ages, meaning the more you play it, the better it will sound. The body features select mahogany with single-ply white binding on the back. The mahogany neck and body, combined with the solid spruce top, make for the perfect combination of tone, warmth and brilliance with a bigger sound than you would expect from a smaller-sized guitar. The smaller body (15.5 in. wide at lower bout) and straight rosewood bridge also influence the EL-00 PRO's distinctive voice which is more focused than a dreadnought and perfect for singers. The rosewood bridge features a compensated imitation bone saddle. The 24.75 in. scale select mahogany neck has a Slim Taper D profile with a 1.68 in. nut and is set with a hand-fitted dovetail neck joint using premium Titebond glue. The rosewood fingerboard has a 12 in. radius, single-ply black binding, 19 medium frets, and pearloid dot inlays. The natural finish is complemented by a tortoise shell-style pickguard with a vintage metal "E". This special guitar also features Epiphone's no-nonsense quality, including nickel hardware, strap buttons, a 1/4" endpin, Grover 14:1 machine heads with mini-buttons, D'Addario Phosphor (12-53) strings, and carries a Limited Lifetime Warranty against defects in materials or workmanship. Pickguard: Tortoise shell style with vintage style metal "E"